If runners are already abnormal, Distance Mavens are even more so. Distance Mavens possess the awareness and ability to spill that hour of exceptional living during a run into the remaining hours of their day. Excellence in everything means to live an extraordinary existence not only in the running sphere but in the entire amphitheater of life. There is no aspect of life in which they wish to be ordinary or to settle for average. I’ve read just about every book about running. The upper level of my pantheon includes Once a Runner, which I can almost recite, Running with the Buffaloes, and a few others. Its been a while since I’ve read something that I immediately wanted to read again, but that is exactly how I felt about Running the Edge when I finished it over the weekend. Add a new member to the reading list hall-of-fame! 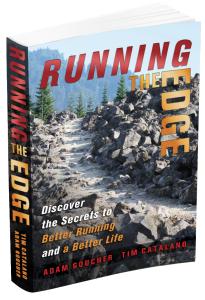 Running the Edge was written by Tim Catalano and Adam Goucher. Most folks who have been around the sport for more than a few years are aware of Goucher’s accomplishments; his resume goes well-beyond being “Mr. Kara Goucher.” Adam was one of running’s major superstars when I first got into the sport in 2001, and I have always admired his tenacity and rooted for him over the years. Catalano was also a national class runner (He and Adam were teammates at Colorado). He is now a (highly innovative) high school teacher and XC/Track coach. This is not a book on training, but it will change the way you approach running. Its not written as a motivational piece, but every page inspires. It isn’t a biography about Adam and Tim, but the personal stories that they share give the book cohesiveness and provide the reader with a personal connection to the authors. So what is this book about? I don’t know how to categorize it, other than say its one of the few books that you have to read if you are a runner. Its fills a very important void in running literature, forces you to look inward and be true to yourself on your quest to become a better runner, and explores how these lessons we learn through running can make us a better person in all aspects of our lives. The “goal” of the book is to get you to strive to become a Distance Maven... “... to commit to taking the actions necessary to create an ideal version of yourself to live an extraordinary life...” A Distance Maven is someone who excels at running and life through thought and action. Adam and Tim take you through the “5 stories” of our lives (Education, Career, Family, Friends, Passions). There are lots of engaging activities built into the book, and the authors ask you to honestly assess yourself in each of these stories, then think about where you strive to be in each story and make a plan to get there. The true distance maven is not just a fast runner; they excel at all of their life stories. Adam and Tim are big on self-actualization. They provide “Six Mirrors” through which we can examine ourselves: Initiative, Responsibility, Determination, Adaptability, Integrity, and Person-ability. This book is best read with a pen and notebook handy. Its a useful exercise to honestly assess how you stack up in each of these mirrors compared to the ideal version of yourself. Immediately, you begin to see ways in which you can improve yourself. The book does not read as a psychology textbook, however! All of it comes back to running, and the authors also provide lots of personal stories and anecdotes. I was impressed by how open Adam and Tim were in these stories; they were not afraid to criticize themselves in situations where they screwed up, but also give themselves credit when credit was due. Their honesty was refreshing. As they repeatedly point out, we are all works in progress. Writing this book was their way of putting themselves on the path of the distance maven. Don’t be a reactor, be a director of your life. Take risks, act foolish sometimes, find out what your character is made up of. Don’t settle for being normal. Live actively, not passively. The active life may not always be normal or safe, but it will surely be memorable and exciting. Two other parts of the book really stood out. The first was when Tim gave a great example of how to describe the love of running to a non-runner. He said that its like trying to explain the color blue to someone who is blind. Its not until you can see colors that you’re ever going to truly understand the beauty of it. I liked this because I often struggle with how to respond when queried on how I actually find enjoyment in running 18 miles a day, and I’ve already had the chance to use Tim’s example in a conversation. The second, and probably the one that hits home the hardest for me is when Adam and Tim are telling a story about how they decided back in college that “whenever possible, someday should be today!” In other words, don’t wait for life to happen to you... go out and live your life actively. Make things happen! Don’t put things off for the future if you can find a way to make them happen right now. I really like this book because a lot of the ideas they propose, to a certain extent, are the changes I have made in my own life in the past year (especially in regards to running, but also in the other life stories). I’ve been pushing myself to live a life of no regrets, of personable accountability, and to become the best runner and person that I can possibly be. I am the happiest I have ever been in my life at this moment in time. That being said, I still am acutely aware that I have lots of areas to improve upon. I am a work in progress. Running the Edge has gotten me to look even further inward and examine the areas that still have plenty of room for improvement. Whether you are a 2:05 marathoner, trying to break 30 minutes for a 5K, or are trying to find the motivation to resume running after some time off, Running the Edge has something for you. I think you will find inspiration and motivation in this book, but not in the sense of being fired up after thinking about Quenton Cassidy running 60 x 400m. Instead, you’ll look deep down and find it inside yourself. And that is what you really need to become a great runner and ideal all-around person. The fire has to burn from within. In that sense, Running the Edge is a lot more important than any other running or motivational books out there. Running the Edge has a blog and facebook page that are updated all the time with excerpts from the book and new material (like the video I embedded below). You can purchase a copy of the book directly through their website. The edges we are chasing in running and in life are not the same for every person. What defines us as runners and human beings is not how fast we run, the size of our house or bank accounts, our level of education, or any other standard measure of success. It is how close we can get to our own unique edges or maximum potential. If you can compare it to Once a Runner, than it must be good. I'll add it to my read list. Thanks for the review! On my list.